MormonInfo.org - False Prophecies - Why did Smith teach the moon was inhabited and why did Young teach the sun was inhabited? Why did Smith say that David Patten was to go on a mission and then he died before he could go? Why did Smith say that the Book of Mormon copyright would sell in Canada and it didn't? Why did Smith teach the moon was inhabited and why did Young teach the sun was inhabited? Why didn't Jesus come back by 1891 as Smith said in the History of the Church 2:182? Why didn't the Civil War become a world war as Smith prophesied in D&C 87? The primary source for Smith’s alleged belief was from Oliver B. Huntington in 1881. He said in his journal that Joseph Smith taught, "The inhabitants of the moon are more of a uniform size than the inhabitants of the earth, being about six feet in height. They dress very much like the Quaker style and are quite general in style or the one fashion of dress. They live to be very old; coming generally, near a thousand years" (History of the Life of Oliver B. Huntington, 10, typed copy, University of Utah). Later in 1892, an LDS article entitled "The Inhabitants of the Moon," recorded Huntington: "As far back as 1837, I know that he [Smith] said the moon was inhabited by men and women the same as this earth, and that they live to a greater age than we do—that they live generally to near the age of a 1000 years. He described the men as averaging near six feet in height, and dressing quite uniformly in something near the Quaker style" (The Young Women's Journal 3:263). Since Huntington is such a late source and because there is nothing else to corroborate him, many remain skeptical that Smith actually held such a belief. But even if he did, this would not entail that it was a prophecy rather than a non-inspired opinion. If the latter, the opinion obviously went far beyond the perhaps common view that the moon was indeed inhabited. Smith’s alleged opinion was much more detailed. So long as he was not acting as a prophet with it, the source of this crazy belief is irrelevant. Smith should rightly be entitled to it. Things are much different, though, for Brigham Young. To our knowledge, he never acknowledged that the moon was inhabited (he simply claimed man’s knowledge here is ignorance), but he explicitly did so for the sun. 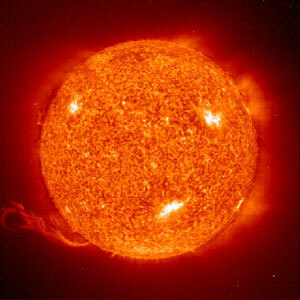 He said, "So it is with regard to the inhabitants of the sun. Do you think it is inhabited? I rather think it is. Do you think there is any life there? No question of it; it was not made in vain. It was made to give light to those who dwell upon it, and to other planets; and so will this earth when it is celestialized" (Journal of Discourses 13:271). Here Young was acting as a prophet in giving this sermon, since he just said right before this statement in a previous sermon that every sermon he gives should be called scripture (13:95). The only problem now is the LDS claim that the biblical authors also assumed the latest errant science of their day. For example, Luther famously pointed to Joshua where God commanded the sun to stand still as absolute confirmation of Ptolemy’s geocentricity and geostationarity (i.e., the earth does not move, but the sun and planets revolve around the earth) and against the heliocentricity and heliostationarity of Copernicus. Did Joshua really teach the former rather than the latter? Joshua and other biblical writers certainly used the language of the sun rising and setting just as we do today, but that doesn’t entail that these biblical writers had a word from the Lord that affirmed the Ptolemaic view. The latter saves the appearances, as it were, but the Lord may have set it up to be quite different from the way things appeared. One’s language to describe those appearances may in fact be accurate according to the way language is used in a particular situation while not being accurate if literally conveying the truth of the world behind those appearances. The biblical writers were not scientists; they were, among other things, truthful reporters of events as they appeared and according to the way their own communities spoke. Concerning these particular matters with the inhabitants of the moon and sun, both Smith and Young seem to have done something different. They both clearly went beyond appearances and rightly expressing those appearances according to the ways dictated by their communities, and they actually gave us the scientific concepts of the way things are. Smith, for all we know, did this non-prophetically (and thus on my view, excusably), but Young clearly did this prophetically (i.e., acting as a prophet). And since we know that the sun is too hot to have inhabitants on it, we have good reason for believing that Young was a false prophet. "With regard to Joseph Smith and the moon: In the 20th century, there have been men on the moon--so if he was speaking prophetically, he was wrong..
"Listen to what the Synagouge of the enemy of Jesus Christ says and you pretty much will know the source of Joe Smith. Very interesting..